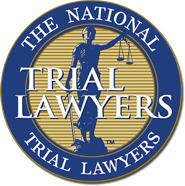 George J. Leontire is part of the National Trial Lawyers Criminal Trial Lawyer of the Year team and a teaching facility member of the Harvard Teaching Faculty Advanced Trial Practice. We are also adept and experienced at handling appeals of both civil and criminal matters in Massachusetts Appeals Court and Supreme Judicial Court, as well as the federal First Circuit Court of Appeals in Boston. If you have been arrested and charged with a crime, you probably already know that you could be hit with enormous fines or forced to spend years in prison, but there is even more at stake than that. Regardless of the penalties imposed by the state, a criminal conviction can cause you to lose your job or the ability to practice your chosen profession, and it can utterly destroy your marriage, your family, and your reputation in the community. Never is there more to fight for than when you have been charged with a serious crime in Massachusetts or federal court. You need a team of strong, dedicated criminal defense lawyers on your side to protect you and defend you and look out for your best interests at every step. In Boston and New Bedford, Leontire & Associates, P.C. is here for you. The Boston personal injury lawyers at Leontire & Associates, P.C. are known for taking on some of the most difficult and complex high-profile criminal cases in the nation. 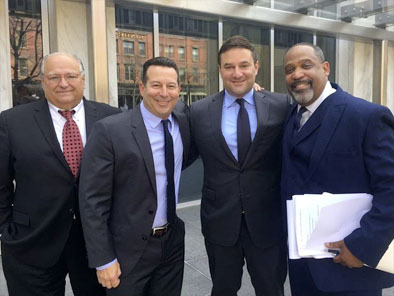 Individuals who have already been convicted in the court of public opinion have gone through the crucible of a public trial with our lawyers advocating for them, and they have come out the other side with their lives and liberty intact, vindicated of the charges brought against them. If you need help with a Boston personal injury or civil litigation matter, or if you have been charged with a crime in the federal or MA court system, contact Leontire & Associates, P.C.’s Boston or New Bedford office by calling 855-223-9080 for a no-cost, confidential consultation on your case. "Defense attorneys for Aaron Hernandez — including ex-New Bedford City Solicitor George J. Leontire — hailed a Suffolk County jury’s acquittal last week of the former New England Patriot in a double 2012 slaying ..."
DISCLAIMER: Completing and submitting this form or otherwise merely contacting Leontire & Associates, P.C. or any individual at the firm will not establish an attorney/client relationship. Our firm cannot represent you until we determine that there would be no conflict of interest and that we are otherwise able to accept representation of your case. Please do not send any information or documents until a formal attorney/client relationship has been established through an interview with an attorney and you have been given authorization in the form of an engagement letter with Leontire & Associates, P.C.. Any information or documents sent via this form or otherwise prior to your receipt of an engagement letter will not be treated as confidences, secrets, or protected information of any nature. 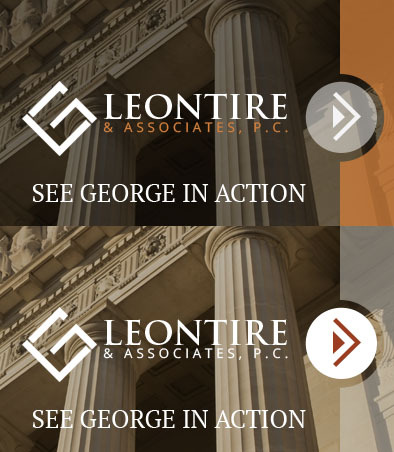 Submitting information regarding your potential case will not bar Leontire & Associates, P.C. from representing or continuing to represent a person or entity whose interest are adverse to your in condition with your case. I acknowledge that contacting Leontire & Associates, P.C. through this website does not create an attorney-client relationship and information I send is not protected by attorney-client privilege.